Imports of truck & bus radial (TBR) tyres rose by nine per cent to hit a new high of 120,000 units a month in financial year 2016-17 over the previous year. 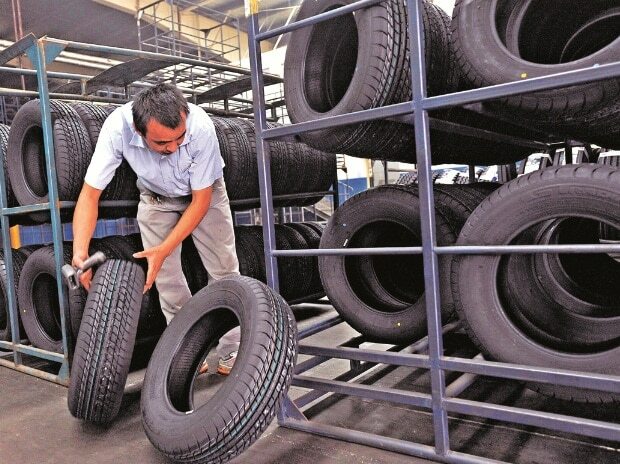 Imported tyres have come to account for 40 per cent of the replacement demand for TBR tyres in India, delivering a severe blow to the domestic industry, which has put hefty investments in TBR manufacturing, say industry representatives. Meanwhile, Automotive Tyre Manufacturers Association (ATMA) has asked the Ministry of Commerce & Industry for early imposition of anti-dumping duty on import of TBR tyres from China, which accounts 92 per cent of TBR's import into India. ATMA is a representative body of 11 large tyre companies in India, accounting for over 90 per cent of tyre production. TBR tyres imports to India have been spiralling upwards during the past few years. According to ATMA, they were up a staggering 200 per cent during the past three years, from 40,000 units a month in FY14 to about 120,000 units in FY17. This is against the interests of tyre majors, who have invested around Rs 35,000 crore in the past 3-4 years in setting up TBR capacities. "TBR has emerged as the growth driver for the industry. Unfortunately, indiscriminate import has queered the pitch for the domestic tyre sector. With expansion in capacity for TBR, capacity utilisation levels have come down to 60-65 per cent from 80-85 per cent three years ago," said ATMA Chairman Satish Sharma, who is also president of Asia-Pacific, Middle East and Africa, Apollo Tyres. ATMA says as much as 60 per cent of the TBR tyres import contract are being handled by small private operators and traders who indulge in unfair practices such as under-invoicing, selling tyres in cash, thus, depriving the exchequer of its revenue. "Demonetisation sucked away the unaccounted cash from the system leading to a significant drop in the import of tyres. However, with remonetisation, the imports have made a serious comeback," said Sharma. More than 90 per cent of TBR tyres import is taking place from China. China's share in the import pie has risen from 40 per cent in FY14 to 92 per cent in FY17. ATMA has alleged that most of the imports from China are being dumped into India as export prices of TBR tyres from China are significantly lower than the prices of such tyres in Chinese domestic market and also from countries such as Thailand and South Korea. The per unit import price from China is even less than the cost of raw materials that go into the making of the tyres. While import duty on natural rubber is 25 per cent in India, import of tyres from China attracts just seven duty which is aiding in the import of tyres. Dumping of TBR tyres at such a large scale is also adversely affecting the interests of rubber growers in India. Truck & bus tyres are primary consumers of domestic natural rubber. However, domestic demand is being increasingly met by Chinese imports, because of which the offtake of natural rubber by tyre industry has been impacted.